It may seem to be early to start preparing students for their End of Grade tests but I'm already starting to teach test prep skills. I noticed my students really struggle with reading for a large about of time and then really trying to answer questions. My goal for Test Prep Fridays is to help build endurance for reading long passages that usually aren't too interesting. Each week I usually am working on one or two specific standards that I then assess on Fridays. For example, the past two weeks we have been working on standard R.L.1 which relates to showing textual evidence and making inferences. I try to pull Social Studies passages that relate to what we have been studying and include several questions that really make my kids think. 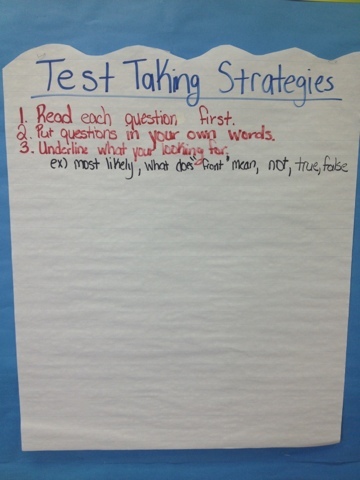 I made an anchor chart in my room that reminds them of strategies to use when taking a test. We talk about things like reading the questions first, rephrasing the question into our own words and underlining important words. To start the lesson we go over the anchor chart and I model a passage with them. Next, they are on their own to use the strategy and show what they know. 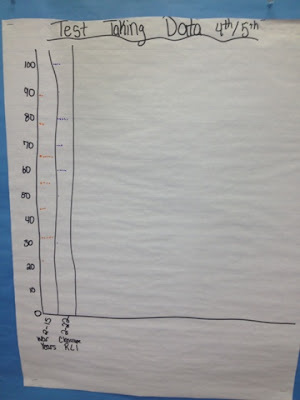 We grade their answers in class and they keep a chart of how they are progressing each week. Although this may not be the most fun activity, it seems to be really helping my students be able to read for a longer amount of time. The rest of the week we are reading engaging novels that most of the class enjoys. To make these test style passages more exciting, I have my students pretend we are detectives and search for "clues" for the correct answers. We get out colored pens to write on the tests with and sometimes use dry erase boards to write down our thinking about the test questions. Everyone loves to write with something other than a pencil so if this helps my students stay more involved in my lessons then I'm all for it. How do you prepare your students for EOG's? What are some strategies you use to help your students be able to read for a longer period of time?